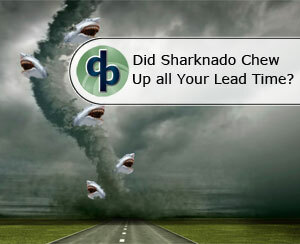 Data Profits > Blog > Resources > Blog > Could #Sharknado be Chewing Up Your Lead Time ? Perception is reality for many companies or where you sit depends on where you stand. If you know lead time issues exist you may believe you know the cause before you assemble the data and analysis to support your conclusions. The opposite is also true; you may believe lead time is not a problem. Some companies believe their short lead times and weekly orders reduce their service risk; often, they don’t even plan or track lead time. Statistically and figuratively companies in this latter group are frequently wrong. 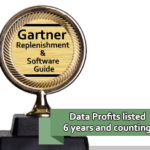 Many companies don’t track or include lead time analysis in their planning process. Instead, they manage lead time issues like a shark sighting – at the last possible moment. Working at the individual PO level, when service issues pop-up like a shark fin on the water surface, it is too late to plan! Studies show that companies, that manage their supply chains holistically, tracking and forecasting each step, are significantly more profitable than their competitors. There ARE sharks in the water, so plan carefully before entering. Your supply chain complexity varies by supplier and is location specific. Lead Time Days can also include many other factors: external – transit days, customs, waiting for approvals, and internal – QA inspections, DC to DC transfers, DC processing time, or product processing time to get them ready to use/ship/sell. Poor Lead Time planning can cause additional freight expense or the purchase of excessive quantities of product to meet your business needs. You might use alternate suppliers with higher logistics or product costs or, worse, air freight! Sometimes you are forced to go big or lose big. Lead Time Forecasting across your supply chain with all your suppliers is an important step in reducing these problems and improving profits! 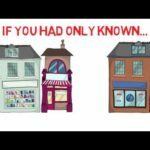 You may want to look at 5 or 10 of your problem suppliers in depth. Start simple; look at the total lead time, not the pieces, that comes later, the goal is to highlight the issues. You can gain further insights by downloading historical information by supplier/location into Excel, generate some averages and graph the variability of allowed lead time versus actual on a PO by PO basis. To find some examples and easy directions on accomplishing this, download our New Lead Time Forecasting Toolkit. The kit contains: “Guide to Lead Time Analysis,” an Excel ™ workbook w/examples and instructions on analyzing lead time information, a PowerPoint™ presentation “Lead Time Forecasting,” along with several topical articles. After analyzing a few vendors your results may suggest automating your review using a Lead Time Forecasting Program. A Lead Time Forecasting Program will track all of your supplier, location, product combinations and tell you the correct lead time. Effective solutions will have tools to identify seasonality and other LT influences. Lead Time Forecasting software should also create exception management and allow you to tell the system when long lead times are to be ignored in special cases like placing seasonal orders months ahead of normal operations. A clear vision of Lead Time can help you avoid the sharks, whether they’re based on land, sea, tornadoes, or even alien planets. Like looking out across a vast ocean, many companies have a large number of product locations. Automated Lead Time Forecasting and exception management tools are a key to success; get your supply chain swimming in profits. 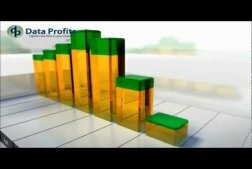 There are SaaS solutions on the market now that are easily installed and should pay for themselves with an ROI reached in weeks. Eliminate the sharks and you can sail into greater success. Lead Time Forecasting, and Lead Time variance for your Inventory Replenishment designed from day one for you by retailers and wholesalers. Contact us for a free review of your current Inventory Replenishment issues. We have the experience and tools to help you improve your business. Also, request a demo to learn how our software can reduce inventory costs and improve service that will increase sales. We install in 30 days at a fraction of the cost of legacy systems. #Sharknado – Learn more about Sharknado and the sequel.